This text is from the back cover of Seeds of Change and it gives a good overview of what the anthology is about and what it is intended to be. The stories are about what could be considered “trigger” issues and the writers here tackle the issues in a variety of ways with varying levels of success. “N-Words” by Ted Kosmatka is the story I both feared and looked forward to. From the title it is easy to guess that “N-Words” is the “racism” story, only rather than being about black and white, the titular N-Word is Neanderthal. Yeah, I didn’t see that coming, either. Cloning technology in the near future will improve to such that human cloning is possible, though of course done in North Korea and not America. The racism seen by the Neanderthals mirrors, in part some of the racism seen today, but extends it because of the “unnatural” nature of the Neanderthals. It is worth pointing out that in Kosmatka’s story, the Neanderthals are nothing like the stereotype. “N-Words” is a bit in-your-face and obvious with the racism and discrimination much of society inflicts upon the Neanderthals. This is perhaps the point, but it does make the story a bit less effective whenever it feels overly didactic. Yet, despite the obviousness of “N-Words”, it’s not a bad story. It’s an entertaining read and of course it is intended to cause the reader to think about the stupidity of our own racism, but it’s an okay read. I haven’t read the Robert Sawyer Neanderthals trilogy (starts with Hominids), but I wonder how he handled something of a similar subject. Jay Lake takes on a slightly less heated subject in his story “The Future by Degrees”. At this point I should apologize for the pun, but I just could not resist it. “The Future by Degrees” is a story of technology and deceit. The technology in question can more efficiently transfer heat, thermal superconductivity. I could probably spend more words than are in the story to attempt to describe it. Suffice it to say that it has to do with heat and the existence of such a device would be incredible. What Jay Lake does so well in “The Future by Degrees” is that there is an actual story here rather that set pieces built specifically around the topic. Jay Lake gets at the idea that there are people / companies driven solely by profit (perhaps lots of people / companies) who would seek to suppress a technology which could benefit society / humanity, but would cut into their profits. That’s what the story is about, only it is for a technology that does not currently exist (though hopefully someday. It’s a really good story and a great way to start setting up the rest of the anthology. K. D. Wentworth's "Drinking Problem" is something of a fun story. Fun for the readers, but not at all for the characters within the story. See, this is (among other things) the recycling story where beer can only be sold in non-recyclable Smart Bottles, but without the Smart Bottle, no drinking. Wentworth shows the insanity which can result from that and what technology can do (and probably will someday). Wentworth states in her story introduction that the story is about the unintended consequences of technology. Smart Bottles are supposed to be for recycling, but the consequences are vastly different than anticipated. "Drinking Problem" is probably the best story in the anthology. "Endosymbiont" by Blake Charlton deals with the future of healthcare and technology and in the case of this story about how technology can serve patients. In this case, a cancer patient. As the story progresses we learn more about the patient and the technology and "Endosymbiont" gets a bit meta and makes the reader think about how this all fits together. Interesting story. "A Dance Called Armageddon" by Ken MacLeod works around the end of the world and a potential nuclear war. I don't have much to say about this story, except that everything goes on behind the scenes and the story itself doesn't have much visible meat. The story is not as strong as some of the other stories in this anthology. “Arties Aren't Stupid” is perhaps my least favorite story in the anthology and one that simply did not work on any level for me as a reader. The story by Jeremiah Tolbert and it has some odd environmental art and a weird class / caste system in place where “arties” (those who do nothing but create art in public) get some help by the braniacs (those who gain knowledge). I’m not really sure how to describe “Arties Aren’t Stupid”, but from the first page I had to force myself to continue and had this not been a review copy, I’d have not finished this story. I did enjoy, however, the Mark Budz story “Faceless in Gethsemane”. This is a story of people trying so hard to avoid visual prejudice that they would submit to a surgery so they can no longer recognize color or distinguishing facial features. This way they can only judge a person by his or her actions, but they lose out on that aspect of humanity which can see beauty and allows them to be whole. Rather than taking the story on a macro level, however, Budz tells the story on a micro level with Trevor’s sister getting the surgery and coming to visit, which upsets Trevor’s wife. There are glimpses of the sort of prejudice which “N-Words” deals with, only in a lower key (and yet somehow more hateful) manner. The Budz story is sort of like a stronger version of “N-Words”, though the prejudice is not against anything visual. Nnedi Okorafor-Mbachu takes the reader to Africa with "Spider the Artist" and writes about oil, kind of. This is a theme of the best of the stories in this anthology (of which "Spider the Artist" belongs), the stories deal with a topic, but they aren't really *about* that topic. Africa (in this story, perhaps in reality) has oil pipelines running through it and despite the proximity to oil, the people and nations are poor. With small spills and pipeline eruptions the oil companies go to great lengths to protect the oil from the people of Africa. "Spider the Artist" is a story of friendship between a woman and one of the machines set to guard the pipeline, is about spousal abuse, about Africa, about oil rights, and is about other things I haven't picked up on yet. What it is an excellent story. “Resistance” by Tobias S. Buckell shows us how America (or any society) built around democracy could give away its democracy when it isn’t paying attention. Except, this is done in the Ragamuffin universe and Buckell uses the character of Pepper to tell the story of “Resistance”. Perhaps because of my familiarity with Pepper and the Ragamuffin universe, “Resistance” was one my favorite stories in this anthology. It works with the theme of the anthology, though in a different way perhaps than the reader might expect having come through stories set in the near-future, but the story works. Outside of giving up Democracy for fear, “Resistance” offers another way that a fully democratic society might give up its franchise: technology. Thinking about convenience, something of a singularity (how I hate this term) could occur and not with a bang democracy has gone. The question of whether the citizens of this story would be better off without democracy is up for debate, but “Resistance” is a fascinating story which just happens to include Pepper. 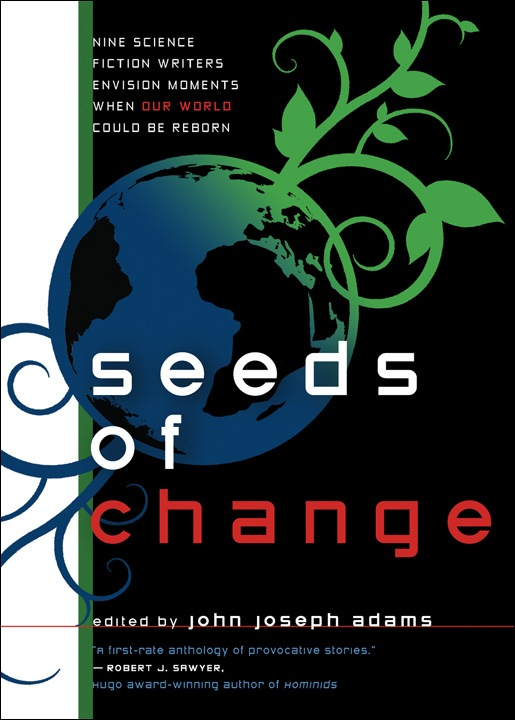 On my first read-through of Seeds of Change I looked at the stories individually and thought, well, some of the stories are quite good, others are quite not, and the stories as whole are a bit of a mixed bag. This is what one is likely to get with an anthology, especially an anthology of original stories. Reprint anthologies succeed by grabbing stories already acknowledged as great. Original anthologies succeed by the strength of the submission pool. Outside of a couple of stories here that hew too strongly to the theme and pay less attention to the fact that the story needs to be a story, Seeds of Change is a strong original anthology. Had I written this review two weeks ago when I first finished Seeds of Change, my closing marks may not have been as positive. At the time I was not fully blown away because I wanted every story to be "Spider the Artist", "Drinking Problem", and "Faceless in Gethsemene", and there were some weak links here. Then, as the weeks progressed and I still could not figure out exactly what I wanted to say about Seeds of Change, I began to feel more impressed with the overall quality of the anthology. Out of the nine stories there were far more here which I enjoyed than not. The disappointment of "Arties Aren't Stupid" and the didactic nature of "N-Words" were not enough to diminish my appreciation of the anthology. John Joseph Adams' first reprint anthology (Wastelands) may been stronger, but Seeds of Change is more than worth the read and it is an anthology which sticks with the reader and improves upon further reflection, especially when we have the chance to step back and forget for a moment that "Spider the Artist" is the "oil" story and "Resistance" is the "visual prejudice" story. Reading copy provided courtesy of John Joseph Adams and Prime Books. I've been hearing about this anthology a lot. It sounds pretty cool. I'm going to check it out.